Top photos are Donald Curlee and Melissa Wilmouth. Bottom photos are Mary Caetano and Jessica Hammatt. 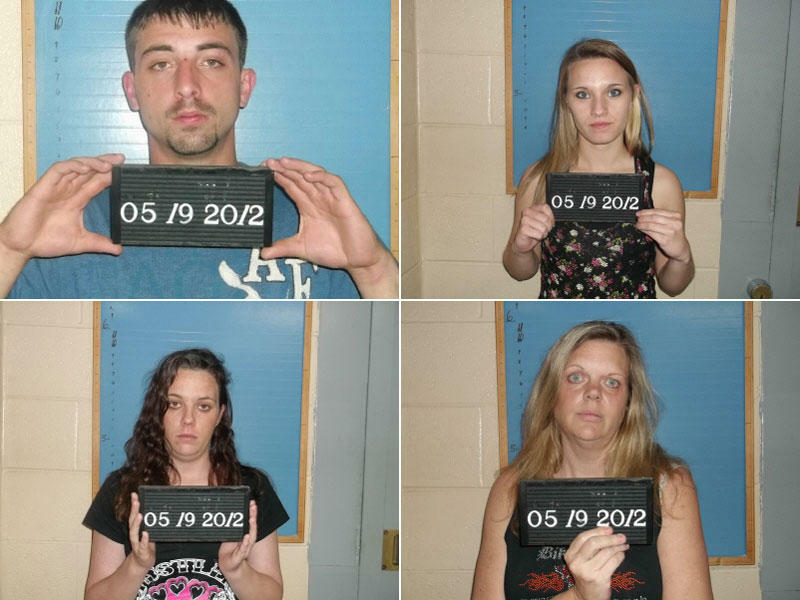 A number of people were charged with various offenses for activities which occurred at or near the annual Good Ole Days of Cannon County celebration. Three were charged following one incident. Donald Lee Curlee, 2528 Auburntown Rd., Wooodbury, was charged with DUI 1st Offense, Simple Possession of Marijuana and Contributing to the Delinquency on May 18. Melissa Wilmouth, 107 W. Laurel St., Woodbury, a passenger in the vehicle Curlee was driving, was charged with Simple Possession of Marijuana and violation of the 18-20 Possession law. Another passenger, a juvenile, was charged with Simple Possession of Marijuana and Underage Consumption. Law enforcement officers were first alerted to the situation when they were informed that beer cans were being thrown out of Curlee's vehicle while it was traveling on McMinnville Hwy. When Curlee parked on Water St. and was approached by officers, he had a very strong odor of alcohol about him when he exited his truck. A baggie of marijuana was found on the seat where the juvenile was sitting. A search uncovered an open bottle of Jagermeister Liqueur, half-empty, along with an empty carton of Red Bull energy drink used to make "Jagerbombs." The juvenile was released to parental custody. Curlee was released under $5,500 bond. Wilmouth's bond was set at $2,500. They are scheduled to appear in court on June 19. • In a separate incident on May 18, Mary Leonard Caetano, 3204 Petty Gap Rd., Woodbury, was charged with Possession of Drug Paraphernalia and Public Intoxication and Jessica Layne Hammatt, 415 Rains Lane, Woodbury, was charged with Public Intoxication. Woodbury Patrolman John House responded to an assistance call from Deputy Seth Perry of the Cannon County Sheriff's Department. It sounded as though Deputy Perry was involved in a foot pursuit in the alley way next to Joe's Place. Officer House ran into the alley (behind Sheriff Darrell Young) and as the alley way opened up to the rear parking lot, Officer House saw Deputy Perry near a dumpster and some vehicles. Officer House circled around to the other side of the dumpster. As officers closed in, Hammett emerged. Hammett's speech was slurred, she smelled of an alcoholic beverage as she spoke, and she attempted multiple times to defeat the portable breath test by not blowing hard or long enough. Deputy Perry had been pursuing Hammatt because one of the Good Ole Days merchants had reported stolen jewelry and Hammett and two other females were identified as possible suspects. Deputy Travis Turney then advised he had one of the suspects with him. That person was identified as Caetano. She appeared to be under the influence. She had difficult answering direct questions, had trouble locating her keys, and missed the key hole several times when trying to unlock her vehicle. A subsequent search of Caetano's purse uncovered several items of paraphernalia, including a metal tube which appeared to have been used as a pipe, a metal plunger, a metal vial with residue, a plastic container with residue, a bag of needles, a Brillo pad, a pair of scissors with Brillo fragments on it, and two baggies containing Brillo fragments. Both Caetano and Hammett were taken to the jail. It was later learned that some pieces of jewelry were recovered near or in the alley next to Joe's Place. Hammett's bond was set at $500 and Caetano's at $3,500. Both are set to appear in court on July 24.